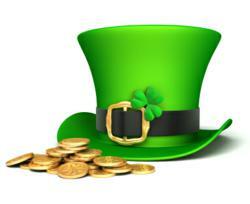 On Saturday, March 17, 2012, green beer, leprechauns and four-leaf clovers mark the world-wide celebration of St. Patrick’s Day – and Charles Gaudet, founder of PredictableProfits.com, says that entrepreneurs may want to consider using this occasion as an opportunity to develop creative small business marketing strategies that stimulate sales. Gaudet says that customers are driven to look for something new and exciting. Using special occasions, like St. Patrick’s Day, to create a new and exciting marketing strategy gives entrepreneurs the ability to offer a time-limited opportunity to their buyers. 2. Entrepreneurs can offer a special one-time discount on everything that is green inside of their store. 3. Use the leprechauns “pot of gold” in a campaign such as: “Anyone that makes a purchase on St. Patty’s day will be entered to win a ‘pot of gold’.” (And define the prize). 4. Another creative marketing strategy is to offer a bulk discount using the four-leaf clover. “On St. Patty’s Day, we’re celebrating with a special ‘4 Leaf Clover Sale’! Buy 3 and get the 4th free on any item marked with a four-leaf clover! “People ignore repetitive marketing messages; however, a well executed and creative marketing strategy can provide a powerful way that you can help your business stand apart from the crowd,” says Gaudet. For more information on how to improve your marketing and position your company as a leader in the market, please visit http://www.PredictableProfits.com and sign up for their free newsletter. ABOUT CHARLES GAUDET: Gaudet started his first business at just four years old and has been involved in entrepreneurial enterprises ever since. Upon finding himself in millions of dollars of debt and under enormous stress at the age of 24, he and his wife systematically grew their first multi-million dollar company. Gaudet has traveled much of the world studying from business, political and social leaders studying entrepreneurial, marketing and business excellence. He is widely regarded as a marketing expert for consistently delivering windfalls of profits to his clients by unveiling opportunities that have been previously under-utilized or have gone unnoticed. ABOUT PREDICTABLE PROFITS: Predictable Profits is a leading small business marketing company and a division of Managed Marketing, LLC. The company specializes in finding overlooked marketing opportunities commonly found in most small-to-medium sized businesses and creating actionable marketing strategies for increasing a company's profits. You can read more about Predictable Profits by visiting the company's website at http://www.PredictableProfits.com.